My paternal grandfather didn’t set out to be a writer. In fact, I’m told he wanted to be an opera singer. These aspirations took him traveling across Germany where he learned to speak the language fluently and, as it turns out, fell in love with the life and writings of Martin Luther. So much so that he translated many from the original German because he felt existing translations had missed the mark. “To John, my son,” …. not, to my son John, which would have sounded trite and diminishing, but to John, my son, which echos a voice from heaven which speaks, this is my Son, whom I love, my only son. As my father was to his father. “Tolle Lege! Tolle lege!”… Take up and read! Apparently from the account of Augustine’s conversion to Christ in his spiritual autobiography ‘Confessions’. My grandfather read widely. His home office and study was filled floor to ceiling with books of the great thinkers of the day and of history. These were his plea to his son, who did not take much to books but rather to fixing and tinkering, to go himself to Word and words and find the truth for himself. “Dum vivimus, vivamus! !” … While we live, let us live. Don’t wait. Don’t waste a moment. Do it now!! Grandfather’s hand has corrected the spelling of the first “vivimus” which he originally wrote “vivamus, vivamus.” He edited himself, in pen, in inscription, because the proper tense was essential for understanding. It is amazing what meaning travels down across generations. 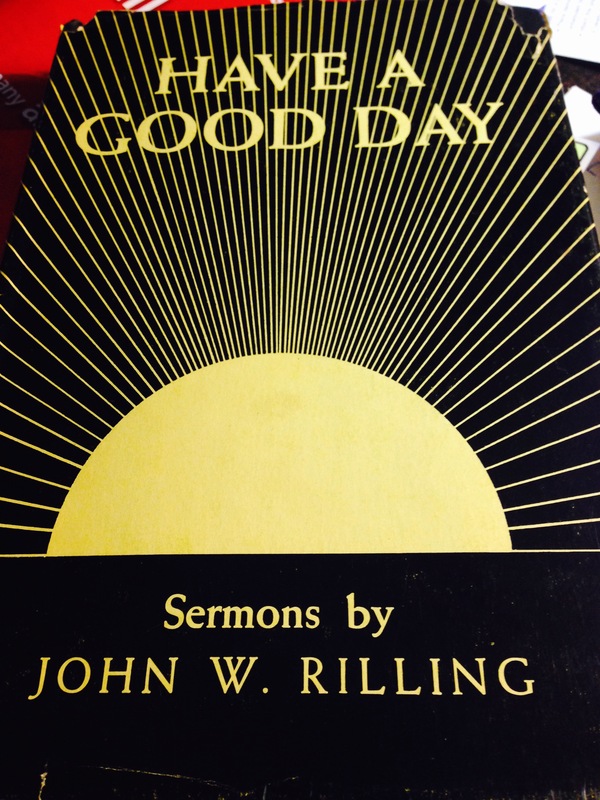 I am not sure my father, John F. Rilling, ever read this book, though it kept its place on a bookshelf spanning many moves, many jobs, many travels. It came to him 5 months after the birth of his first child, a son. And remained through life’s changes, including the last. My father died a year ago and his beloved wife saved the book for me. Today, as I read it, sermon by sermon, it shows me who my grandfather was. I had an inkling but must confess I did not know him. The book literally speaks across generations. The phrasing and the storytelling, the meaning so subtle and profound, the message as true today as it was in the 1950’s when it was spoken to a dear congregation. It begs me to read it out loud. So powerful are its thoughts, I have to take a day or two between readings to digest what he’s written. Who knew the old could be made so new again? Such is the power of words, carefully culled and selected, so they might be collected in a book to be published and shared. And signed. What a treasure. What a trust. What a miracle. If today we communicate wirelessly by an internet we can’t see, is it so impossible that words may speak across generations and even, perhaps, across the veil? My grandfather could not have known when he wrote them that I would ever read his words. They were published before I was born. Yet, they have landed on me and touched me deeply. Gone straight to the heart of another one who didn’t set out to be a writer, rather a thinker and a doer. But something in me kept nagging…you’ve got to write that book so others can know and do for themselves…you can write that book. “While we live, let us live! Posted on September 30, 2015, in art, Deeper Sensation, God, Life, writing and tagged authors, Christian, family, fathers, John W Rilling, meaning of words, sermons, words, writing. Bookmark the permalink. 2 Comments. Indeed, Mary Anne. Perhaps you know someone who would find it life-giving to create such a book?